Anew API has found its way into Apple’s ResearchKit framework that can monitor symptoms associated with Parkinson’s disease. This new Movement Disorder API will allow the Apple Watch or iPhone to continuously monitor common symptoms like tremors, which causes shaking and twitching, and dyskinesia, an abnormality that causes involuntary movement. The recorded data would then be collected and presented in a chart that would allow physicians to check the rate and severity of the patient’s symptoms. Before the Movement Disorder API, Parkinson mPower was Apple’s first foray in Parkinson disease research. Apple’s personal tool and research instrument used questionnaires and sensor data to track and review trends. 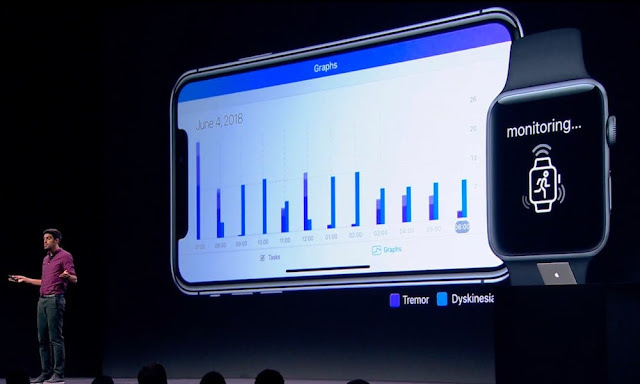 With the Movement Disorder API, Apple ups the ante by giving researchers more comprehensive data to treat and track symptoms. “Since its launch in 2015, the mPower app has enrolled over 10,000 participants, making it the largest Parkinson’s study in history — with 93 percent of participants never having taken part in any kind of research before,” says the official Research and Care Kit webpage. Earlier this week, Apple announced at the Worldwide Developers Conference that it would be opening their Health Records API to developers. According to the press release, Apple intends for researchers to create an ecosystem of apps that use health record data to better manage medications, nutrition plans and diagnosed diseases. “Medical information may be the most important personal information to a consumer, and offering access to Health Records was the first step in empowering them. Now, with the potential of Health Records information paired with HealthKit data, patients are on the path to receiving a holistic view of their health,” said Jeff Williams, Apple’s chief operating officer in the press release. With the announcement of the new Movement Disorder API and Health Records, Apple continues to establish their presence in the medical field and paving the way for better health management with their apps by generating reliable data for medical researchers. I am 63 year old who was diagnosed 8 months ago with Parkinson's. I had severe calf pain, muscle pain, slurred speech, frequent falls, loss of balance, difficulty in getting up from sitting position, I was having a problem accepting my diagnosis, even though I read every thing I could find to read. I was put on Sinemet 3 times daily but it didn’t seem to be helping. After 4 months of been diagnosed I was having difficulty writing. Getting in bed, turning over. There has been little if any progress in finding a cure or reliable treatment. So this year our primary physician suggested I started on Natural Herbal Gardens Parkinson’s Herbal formula which eased my anxiety a bit,We ordered their PD herbal treatment after reading alot of positive reviews, i am happy to report with the help of Natural Herbal Garden natural herbs I have been able to reverse my symptoms using herbs,8 weeks into treatment I improved dramatically. At the end of the full treatment course, the disease is totally under control. No case of Slurred Speech, loss of balance, or weakness. Visit Natural Herbal Gardens official website www. naturalherbalgardens .com This Herbal Protocol is Incredible!! My life is back. I was diagnosed of Parkinsons disease at 60. I had hand tremors, restless sleep, muscle weakness, cognitive decline, voice spasm, stiff achy right arm and ankle. As the disease progressed my symptoms worsened, with my neurologist guidance i started on natural alternative PARKINSONS DISEASE treatment from R.H.F. (Rich Herbs Foundation), the treatment worked very effectively, my severe symptoms simply vanished. Visit www. richherbsfoundation. com. My neurologist was very open when looking at alternative medicines and procedures, this alternative parkinson disease treatment is a breakthrough. I feel better now than I have ever felt and i can feel my strength again.